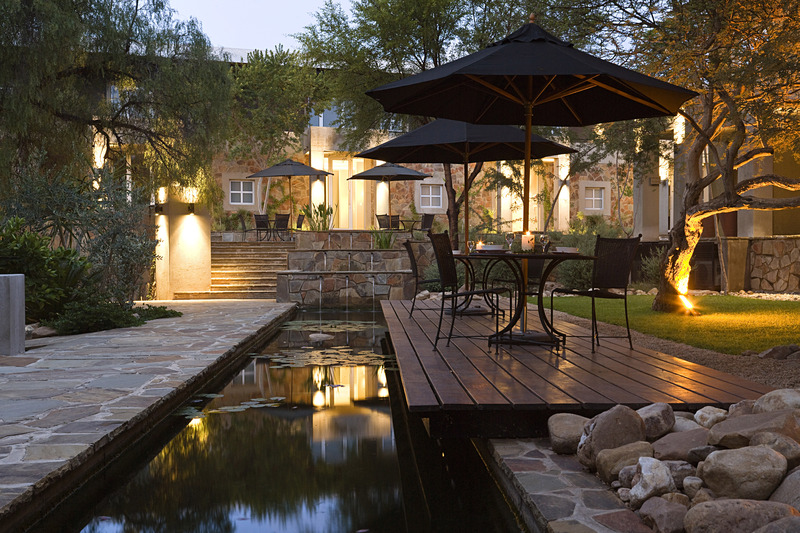 Situated at the very core of Windhoek’s business and financial heart, The Village Courtyard Suites offers a soothing, modern and welcoming environment that invites you to relax from the moment you arrive. It is perfectly suited for business executives and visitors alike, where stylish apartment living and premier hotel services blend seamlessly to deliver an upscale residential experience. Our Village courtyard features paved walkways and seating areas in and around herb gardens, Koi ponds and under a canopy of indigenous trees. This tranquil feature is a perfect example of why the Village is the most tasteful and stress free venue in the region. Friendly and attentive staff are on hand to provide those little but special details and ensure that your stay is both relaxed and memorable. Suite Description: Elegantly furnished and tastefully appointed accommodation smartly designed for the extended stay with en-suite bedrooms, lounge, dining room, kitchen and a work area. The Village Courtyard Suites provide the amenities and services you enjoy at home and expect on your travels in: 	5 x Executive Suites (with the ability to add an extra bed) 	2 x Luxury Suites (2 en-suite bedrooms) Standard features include: 	Crisp, white cotton linen, pillows and duvets 	Well appointed kitchenette with large fridge/freezer and microwave oven 	Fully stocked mini-bar 	Complimentary Tea and Coffee 	Pre-arrival stocking of groceries (on request) 	Fully stocked dining ware 	24 hour access controlled security 	Secure on site parking 	Balcony 	Housekeeping services 	Laundry services 	Air conditioning with heating and cooling 	Complimentary Wireless Broadband 	Electronic in-room safe 	Hairdryers 	DSTV bouquet featured on a flat screen TV 	Credit Cards accepted FACILITIES: 	Breakfast vouchers are supplied for scrumptious meals at the Fresh n’ Wild Café (www.freshnwild.net) which is open all day within the Courtyard 	Well appointed Board Room Facilities 	Room Service from Fresh n Wild Cafe 	Concierge Services 	Lunch available all day 	Baggage Storage Our service philosophy ensures that all your needs are effortlessly met. Children of all ages are welcome.